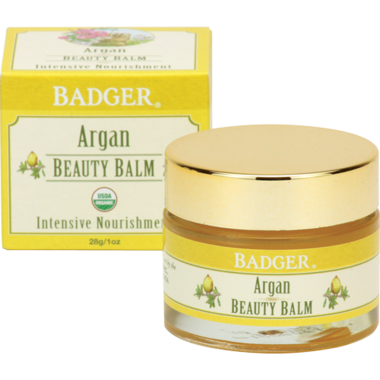 Badger Argan Beauty Balm is a nourishing treatment for face, neck, and under eye area. Great for hands, too! Formulated with certified organic Beeswax and antioxidant-rich oils, this super-emollient and easily absorbed beauty balm keeps skin soft, smooth, and happy. The light floral and citrus aroma of Argan, Sandalwood, and Ylang Ylang smells delightful. Ingredients: Argan Beauty Balm Ingredients:*Helianthus Annuus (Sunflower) Seed Oil, *Ricinus Communis (Castor) Seed Oil, *Cera Alba (Beeswax), *Argania Spinosa (Argan) Kernel Oil, *Adansonia Digitata (Baobab) Seed Oil, *Hippophae Rhamnoides (Seabuckthorn) Fruit Extract, *Citrus Aurantium Dulcis (Orange) Peel Oil, *Citrus Aurantium Bergamia (Bergamot) Peel Oil, *Rosa Canina (Rosehip) Fruit Extract, *Santalum Album (Sandalwood) Oil, Tocopherol (Sunflower Vitamin E), *Cananga Odorata (Ylang Ylang) Flower Oil. This smells horrible. Maybe that's why it was discontinued? Had I known it smelled this bad, I never would have bought it because it's expensive. There's no way I can use this on my face - it's nauseating.